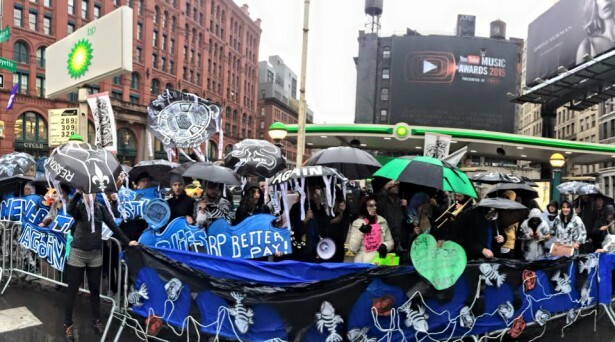 Approximately 50 demonstrators staged a mock second line funeral for the Gulf Coast at a New York City BP gas station. Today marks five years since the BP Deepwater Horizon well blowout in the Gulf of Mexico and an emerging network of activists in the region, together with allies in New York City and as far off as London, are making sure no one forgets about it. “My community and family live in dangerous conditions,” said Brooks Frederick, an artist from Houma, Louisiana, whose most recent project consisted of a series of portraits and landscapes painted using oil recovered from the BP spill. Congregating at a BP gas station, Frederick and approximately 50 other demonstrators staged a mock second line funeral for the Gulf Coast, where residents are still reeling from the effects of the 210 million gallons of oil that spewed into the waters off the coast of Louisiana in 2010, only 25 percent of which was recovered. The protest was conducted as part of a call for a week of demonstrations put out by the Louisiana-based environmental justice initiative, Gulf South Rising, which says it is working to shift the narrative surrounding the spill from one of recovery to resistance. On Wednesday the group kicked off the week of actions with a sit-in at BP headquarters in Houston, calling attention to the ongoing plight of Gulf ecosystems and the people who live within them. The following day in London, demonstrators protested outside a BP shareholders meeting. In March, the company released a report that claimed “the vast majority of the Gulf did not experience harmful exposures to oil and dispersant components” and no long-term damage was caused by the spill. BP says the report draws on scientific data, collected by government agencies and the company itself, but it reads more like PR than anything else. The skyrocketing number of dead dolphins washing up on shore with shriveled black lungs, for instance is, according to BP, “an unusual mortality event” that began before the Deepwater disaster. The company continues to contest the $13.7 billion fine levied against it under the Clean Water Act in federal court. In contrast to the rosy portrait of the Gulf painted by BP, a survey of scientific research surrounding the spill conducted by the National Wildlife Federation found that at least 20 Gulf species have seen their populations shrink at historic rates, dolphins leading the list. Far from cleaning up the spill, the 2 million gallons of the chemical dispersant Corexit BP poured into the Gulf as part of its cleanup effort simply sent the oil into the sediment beneath the water. A study published April 2 from researchers at the University of Alabama at Birmingham links Corexit to a host of health disorders — not only in marine life, but in humans where it can cause lung disease. This has raised fresh questions about the long term health of the thousands of men and women who participated in the Gulf restoration effort and those who were inadvertently exposed to the chemical. If this information suggests that people need to keep raising their voices to hold BP accountable for the ongoing impacts of the disaster, activists have another reason to remain vocal: Offshore drilling is expanding. President Obama continues to pursue plans to allow drilling in the Arctic, while drilling in the Gulf continues. Furthermore, earlier this year, Obama opened up the southern Atlantic coast for exploration. While industry reforms have been implemented, including increased tests for equipment intended to prevent blowouts like the one that occurred on the Deepwater Horizon, critics contend no amount of new regulations will make offshore drilling safe. Until grassroots pressure can put a lid on the lucrative oil BP and other companies of their ilk are after, the likelihood of another Deepwater Horizon remains a distinct possibility.